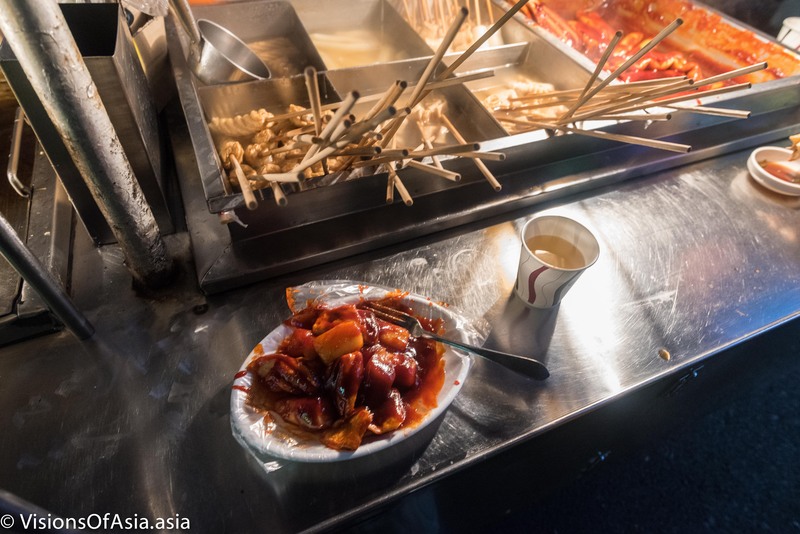 One evening, on returning from my excursion up a mountain, back in December 2017, I decided to do something differently, and have my dinner outdoors at one of the roadside stalls of the place. It was my first experience of street food in Busan. Contrary to what you would expect in Thailand, for example, the Koreans do take hygiene at heart. So, vendors do use plastic gloves when handling food and all of their dishes are single-use. Most of the dishes were simply some form of rice cannelloni as can be seen on the pictures. The sauce was pretty good and in the cold evening of Busan, it did provide a refreshing change from habitual food (although I must say I tried also some delicious kimchi). Most people just eat standing. 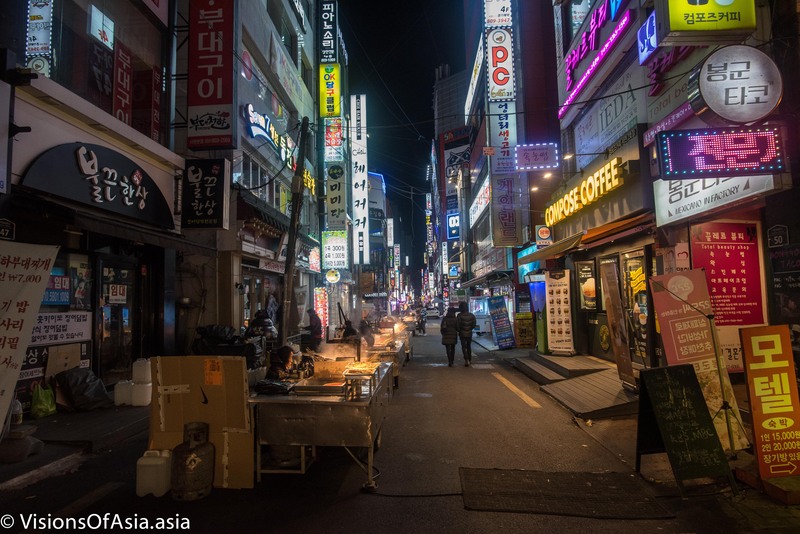 Indeed, one of the lovely things about street food in Busan is also the atmosphere around. 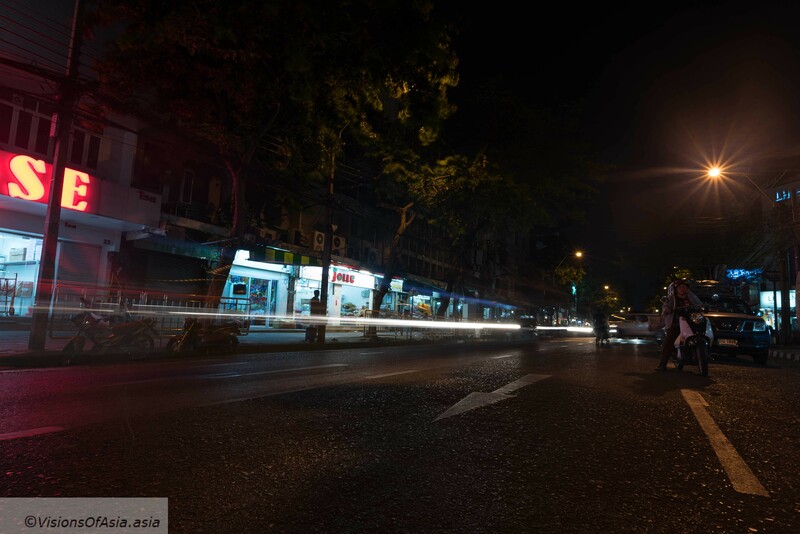 The night lights, the stands and the street’s setting combine to give it a homely atmosphere. Eating out should be done more for sharing in the atmosphere of locals. One local student helped to translate for me my order and was quite curious to know from where I was. 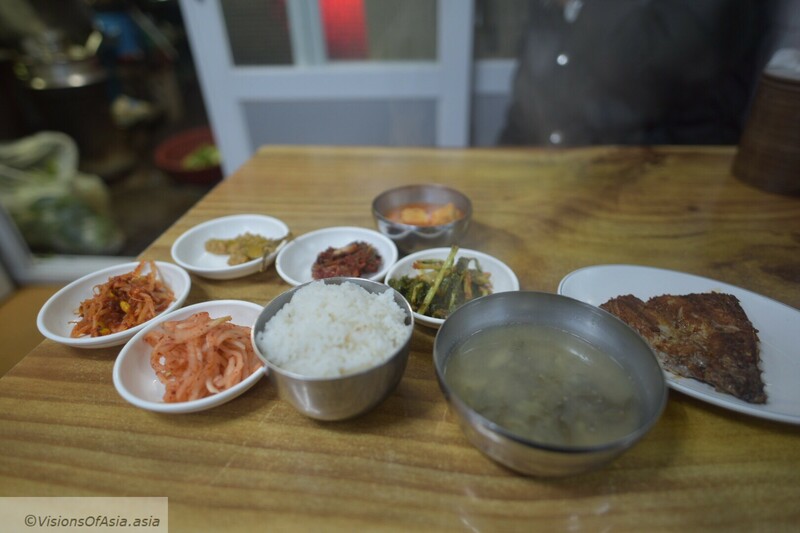 Koreans have always been welcoming and helpful everywhere I went, and Busan was no exception to the rule. Finally, if you prefer eating in a restaurant, there are many places where you can eat kimchi or a full set meal for a very reasonable price. For once, I truly enjoyed “going local”. But then, Korea is a place where even foreigners are gladly welcomed to share the local life. 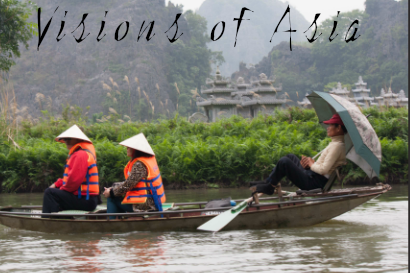 Probably one of my best experiences traveling around Asia. Busan, itself, has a more “rough” feeling to it, but locals are quite friendly and nice. 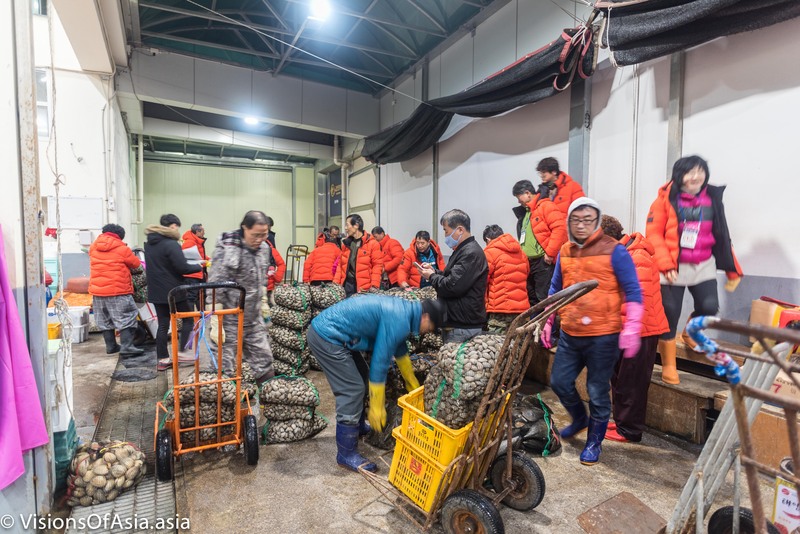 I was in Busan for a couple of days already, and it was my goal to try and see the fish auctions of the Jagalchi fish market. Descriptions and indications are pretty sketchy on how to get to see these auctions given the early hour at which they take place. Nevertheless, as there was no public transportation at that time, I grabbed a taxi to get to Jagalchi fish market, and arrived there around 4.45 AM. The first thing you notice when you arrive at Jagalchi, is the profusion of fish available everywhere. 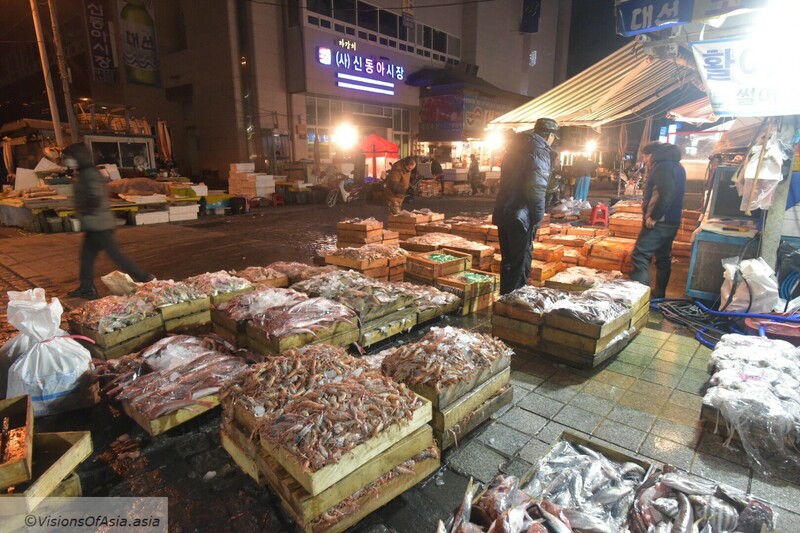 The Jagalchi fish market is one of the most well-furnished markets in terms of fresh seafood, and this general reputation was confirmed seeing the market at 5 AM. I found out one of the main halls where wholesalers present their produce. While it looks astonishingly clean, the floor was drenched in water and there was quite a “fishy” smell in the air. It seems unfortunately that I was quite a bit late there, since I did not manage to find the actual auctions of fish. All I did manage to find was an auction for clams. On the whole, Jagalchi fish market has the reputation of having vendors who are quite hostile to pictures being taken, but my experience was quite the contrary. It is maybe because I look European, or maybe also because I did smile and engage my subjects when taking photos. The interesting thing about a market is the life that gravitates around that market. In fact, vendors need also to feed themselves and need also to rest or have their needs tended to. 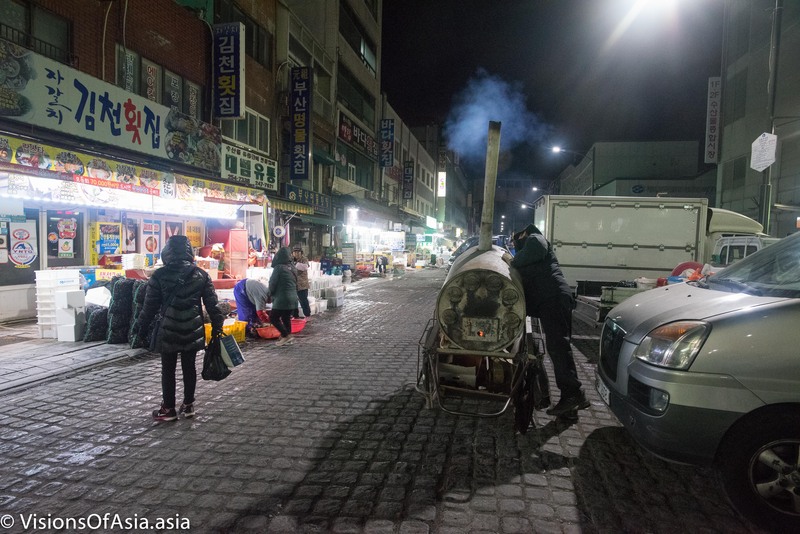 So, you have plenty of small businesses thriving around, like a sweet potato vendor using an old coal furnace. The feeling was extraordinarily atmospheric, being out at 5 AM in the cold and seeing first the market, then the scenes such as this small merchant. The world belongs to the early risers, and this is especially true for photographers. 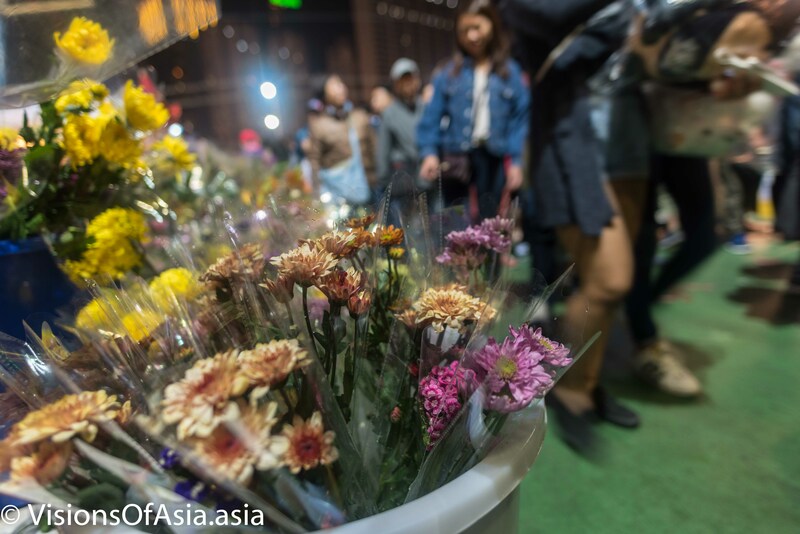 On the technical side, of course, shooting at night is a challenge, but I equipped my Nikon 20mm F.1.8, and this helped me to handle the difficult lighting condition. You could obtain the same results with a (cheaper) 50 mm F 1.8, but then, the inconvenience is that you must stay further from your subject. And nothing engages as much as close range photography for your viewer. My original plan was to enjoy a local breakfast at the hotel. However, on the way, my attention got caught by a local shop grilling fresh fish in front of the shop and serving local breakfasts. I think the owner of the shop got scared seeing a foreigner, as she attempted to tell me her shop is closed, before eventually relenting when a local patron invited me to sit down in front of him. The breakfast was every bit hearty and delicious as expected, with several pickles, a fish soup, and of course, the grilled fish. It was a perfect restoring meal before heading to Haeundae beach, my following stop. 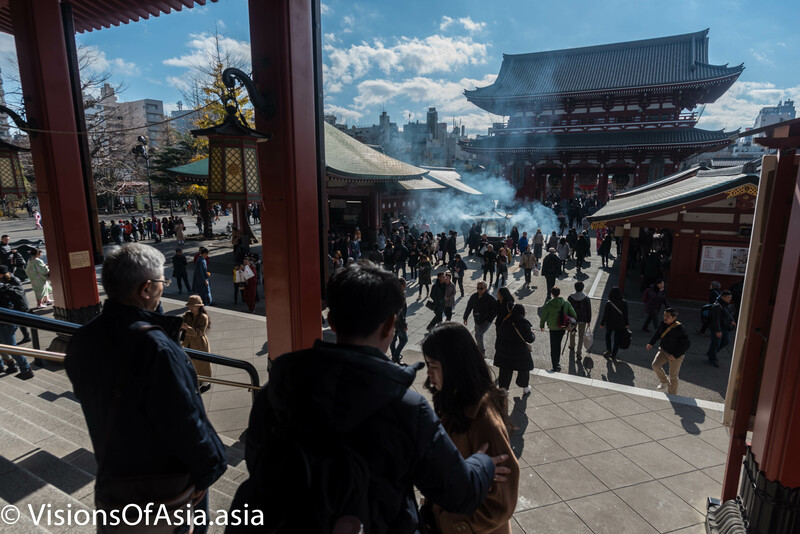 When you visit Tokyo, a must visit if you are in the area of Asakusa is certainly Sensoji, the oldest shrine of the city. 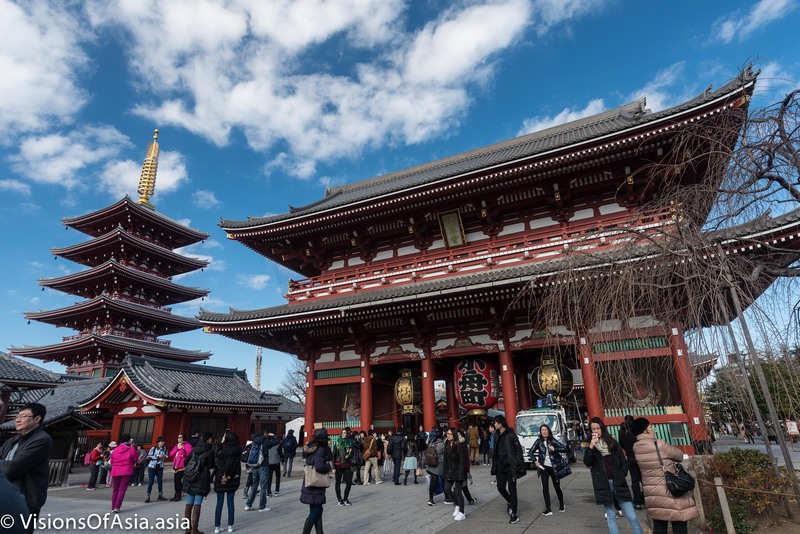 A visit to Sensoji shrine is not only the occasion of watching Japanese and their beliefs which intricates elements of Shintoism along with Buddhism. It is also the occasion of watching numerous ladies and men dressed up in elaborate ceremony kimonos. Sensoji (浅草寺)is so called because it is another way to read the character for “Asakusa”, where the temple is located. I mentioned earlier that Sensoji was the oldest temple in Tokyo, and its establishment dates back to 645 AD. Obviously, the current temple looks too new to still be the original temple. All the more as the area was destroyed in the WWII bombardments. Despite the current relative “freshness” of the shrine building, Sensoji still carries a special weight in the heart of the Tokyo dwellers. 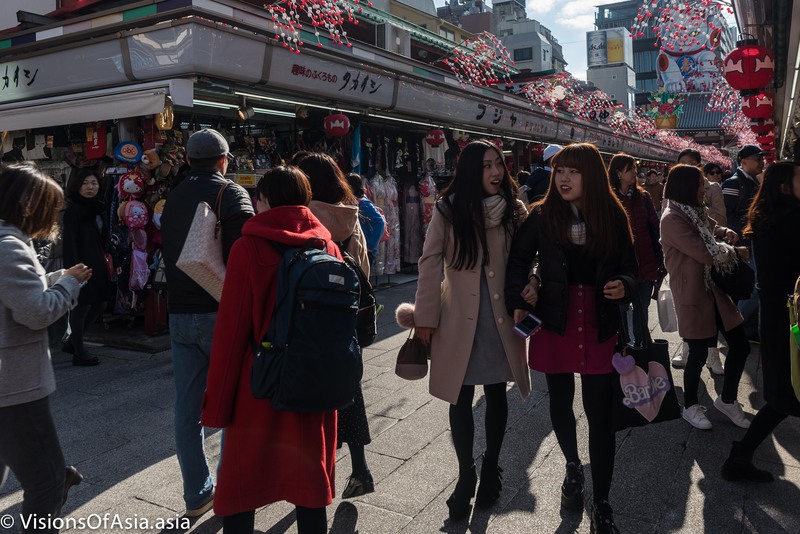 Before entering the temple grounds themselves, there is a very famous shopping street, Nakamise street, mainly targeted to tourists, but still very interesting for visitors. 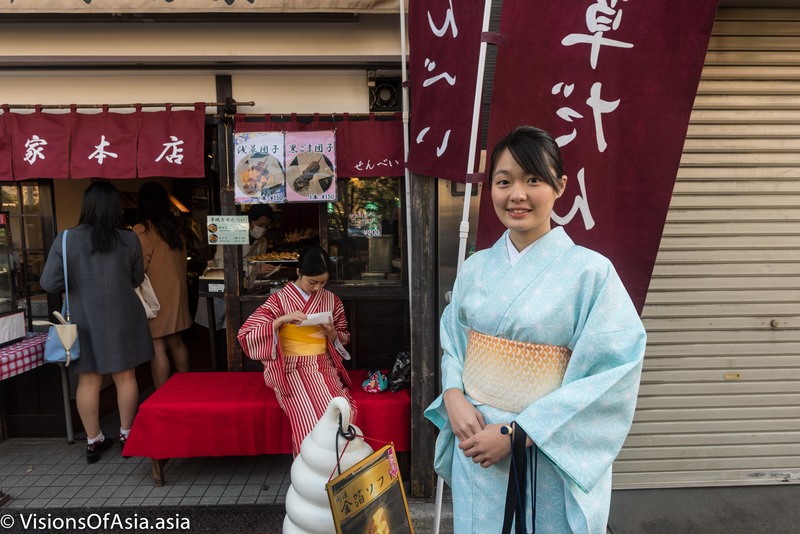 Originally, the street appeared when traders obtained the permission to set up shops in the street leading to the shrine, several centuries ago. While the shops may have been chased away from time to time, and were destroyed to the ground in WWII, today they are back into their prime. Since you are already there, you may want to buy some souvenirs. It might be the occasion to buy some Geta, those traditional Japanese wooden sandals (very comfortable, by the way). 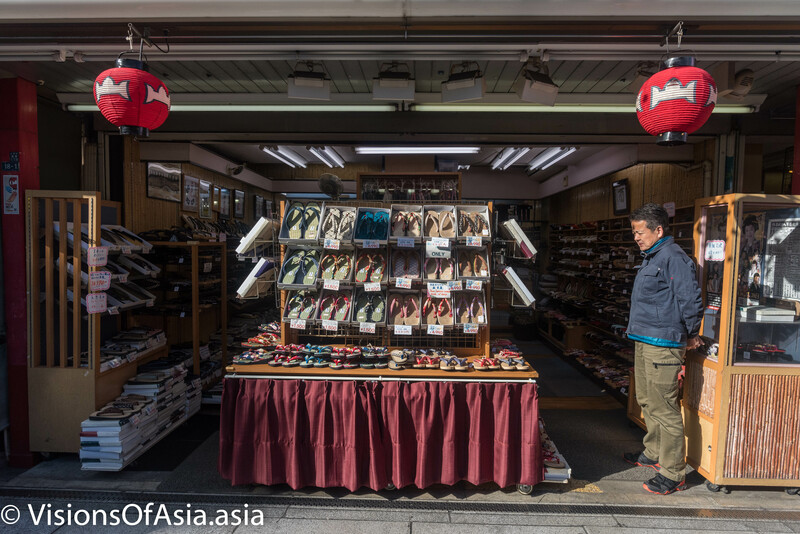 There are shops like the below shop, but while expensive on the main street, you find some interesting deals either in made to order geta or generally sized geta in side streets. I got my own geta from a side street with a very lovely couple. They fit well, and are just as comfortable as the Berkemann slides I habitually wear too. The pair of Geta I bought in Japan. Stylish and easy to wear. 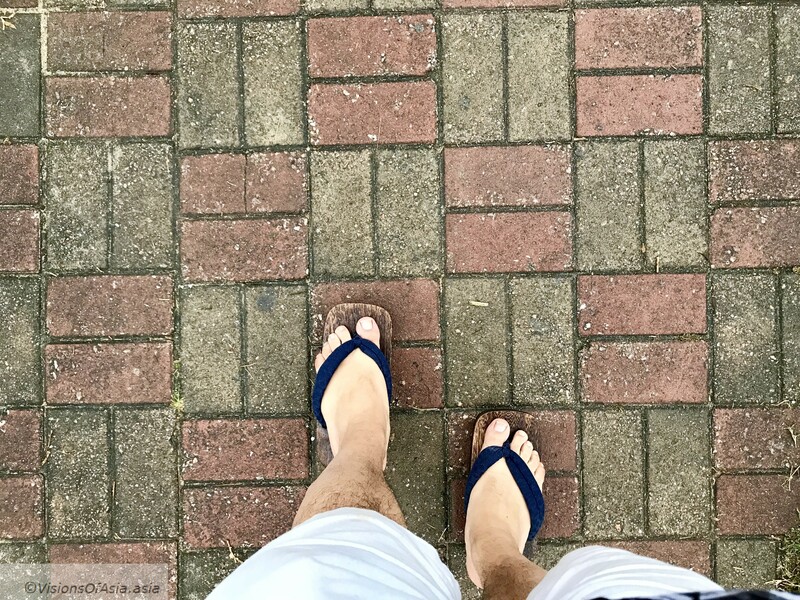 There are plenty of sites explaining how to wear geta, but the general idea is that they should be slightly smaller than your foot. That way, your feet hangs out a little bit. 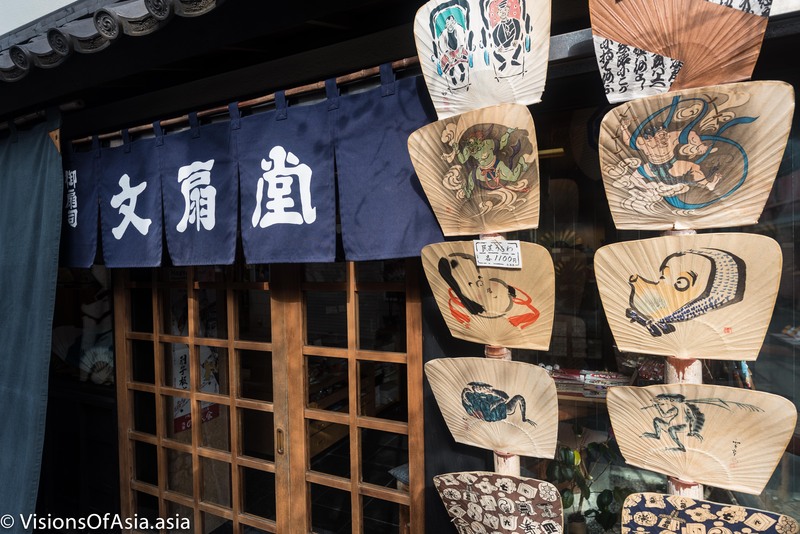 Besides geta, the side streets also display some lovely fans as these hand painted ones (a bargain at 1,100 JPY). The gate to the shrine itself is painted in tones to remind of thunder. This is logical, as it is called Kaminarimon (雷門, “Thunder Gate). 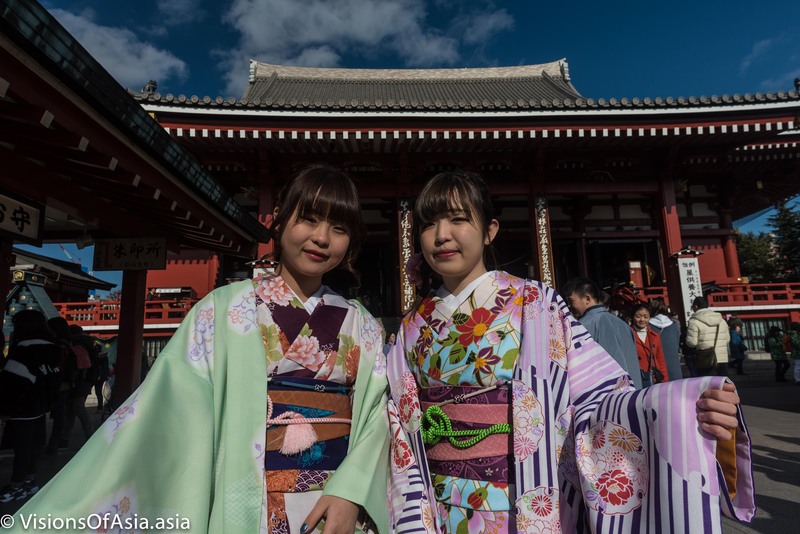 It is nearby that I asked the two lovely Japanese girls if I could take their picture in kimono and they kindly agreed. As much as possible, it is recommended to ask the permission of people to take their picture, as generally, it is frowned on taking pictures even in a public space. A smile and a few words in Japanese help a lot in that respect. It must be said that shrines and temples are often places used for photoshoots of kimonos. Like this group where they were focusing on the elaborate obis (the “belt”) of these furisode. 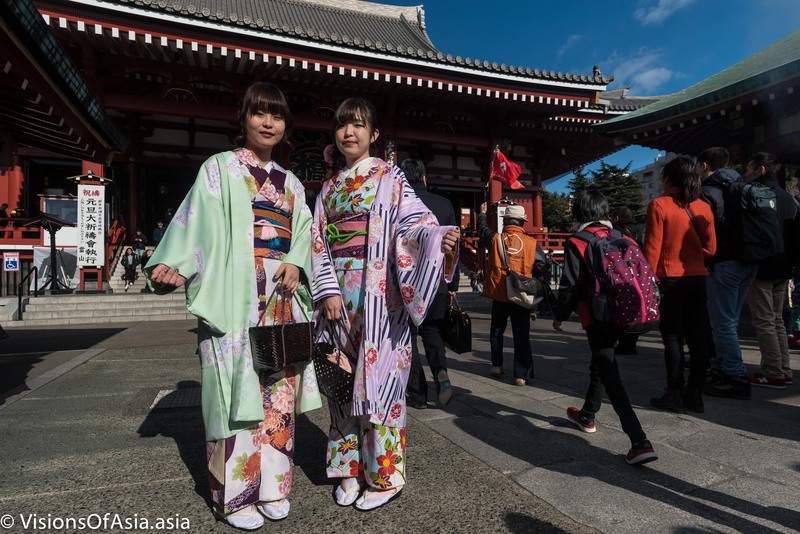 A furisode is a ceremony kimono worn by unmarried young girls and is typically recognizable by the long floating sleeves. A photo shoot of kimonos focusing on the elaborated obis. 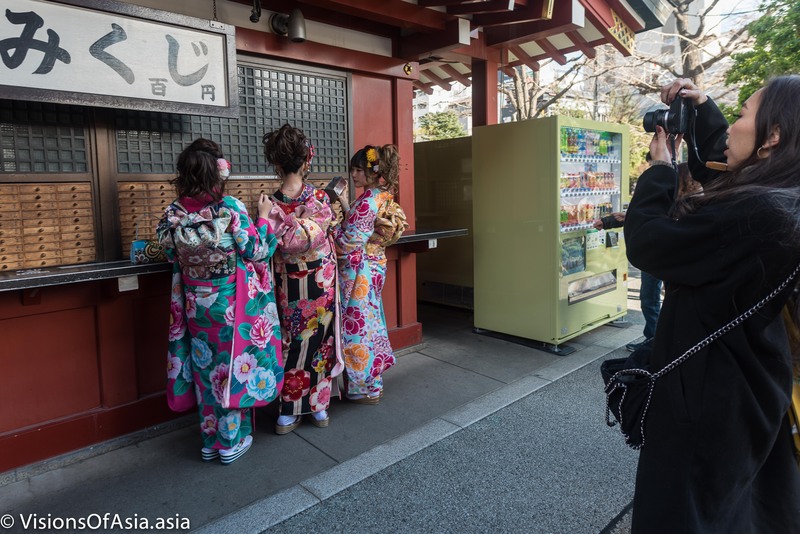 When shooting your picture, if you know some Japanese, it will allow you to distinguish between the “real” Japanese in kimono and those tourists who wear kimonos to have photo sessions. 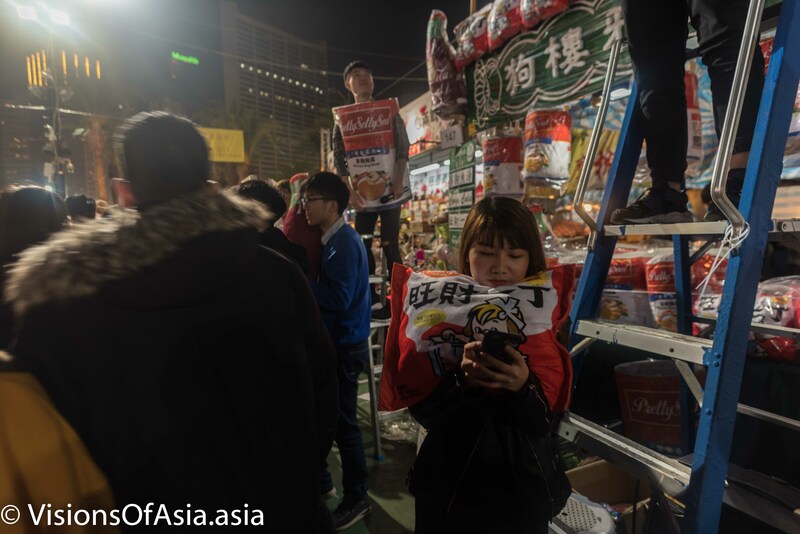 For example, the two young ladies below were from Hong Kong (!) and immediately corrected me when I asked if I could take their picture. They kindly agreed nevertheless to have their picture taken. The meaning of Sensoji probably escapes me a bit, but from inside the shrine itself, you can have a nice view on the bustle in the courtyard as well as on the Kaminarimon . Later, as we went back, our daughter, Maria-Sophia fell in love with the gacha machines. She was too cute, asking to buy one of those little balls with premiums inside. 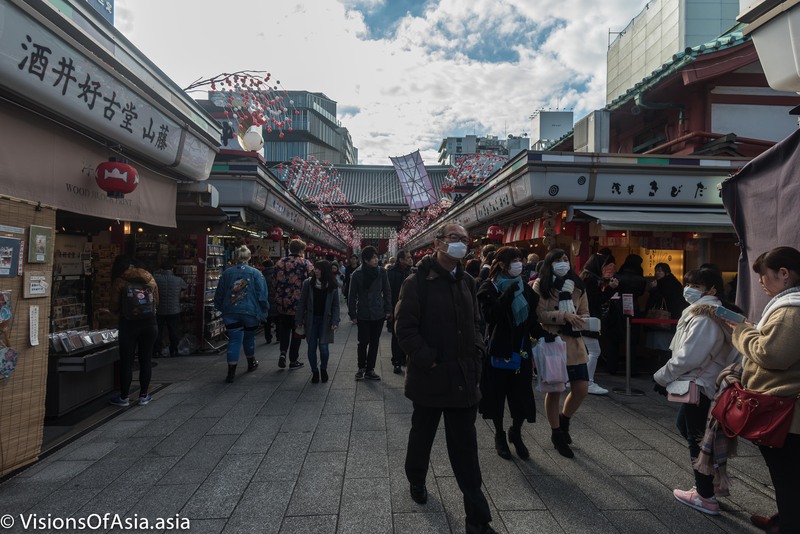 In short, either for shopping or for visiting the shrine, Sensoji is absolutely the place to go if you come to Tokyo. After visiting the Dragon and Tiger pagoda, I caught a taxi, asking him to take me back to Ruifeng night market. Whether I pronounce badly or cannot catch the tones, the driver did not understand… In the end, he understood “MRT”. But then again, he did not drop me at the Arena MRT, he dropped me at another MRT station. 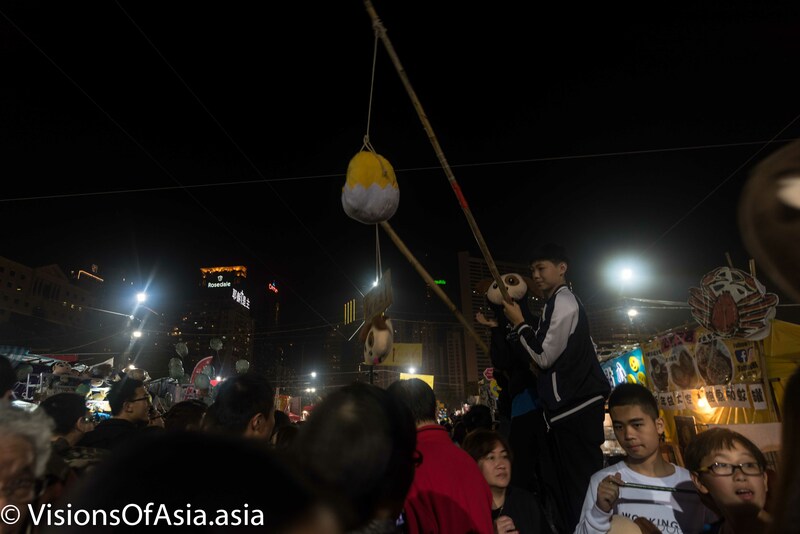 I walked to the Arena area to get to my objective, which was the Ruifeng night market. 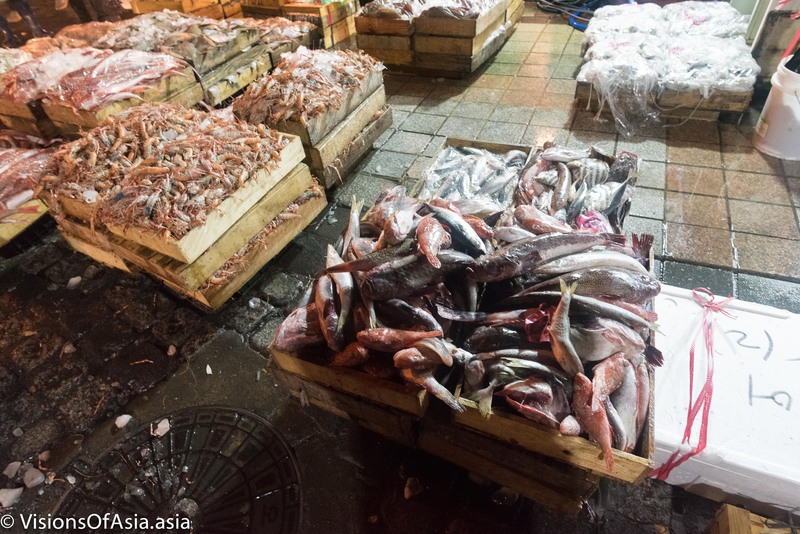 When it comes to food and to passing time, there are two main markets in Kaohsiung. 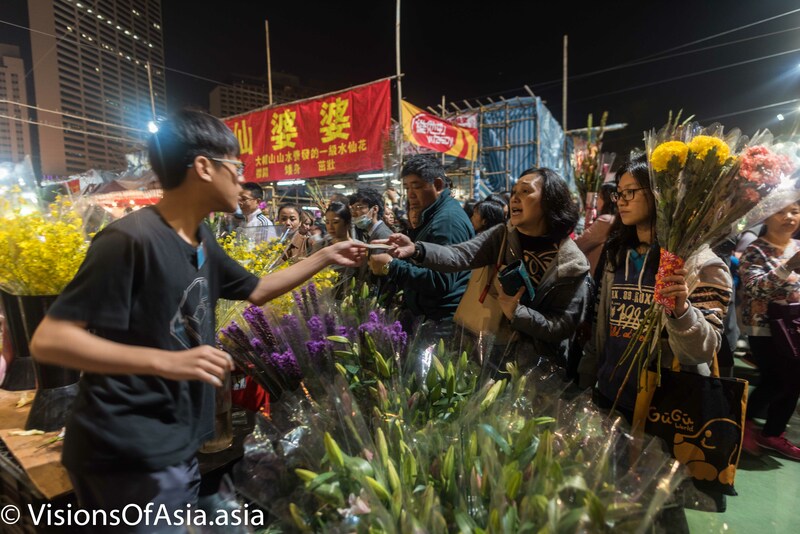 Most tourists hit the Liuhe night market, which is more centrally known and truly geared towards attracting tourists. 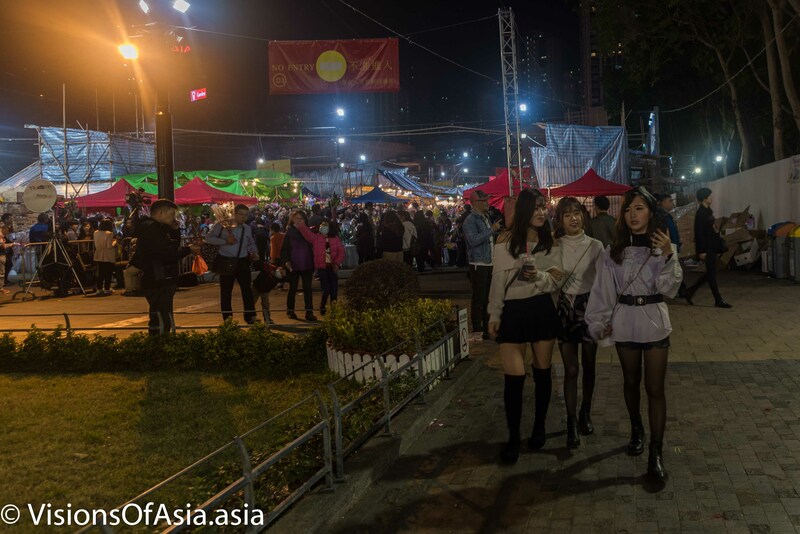 But Kaohsiung inhabitants go to another, place, namely Ruifeng night market. Food there is obviously, at another level than the more tourist-oriented fare of Liuhe. The difference is understood immediately when you arrive at Ruifeng. When you enter the market, a diffuse stench pervades your nose. 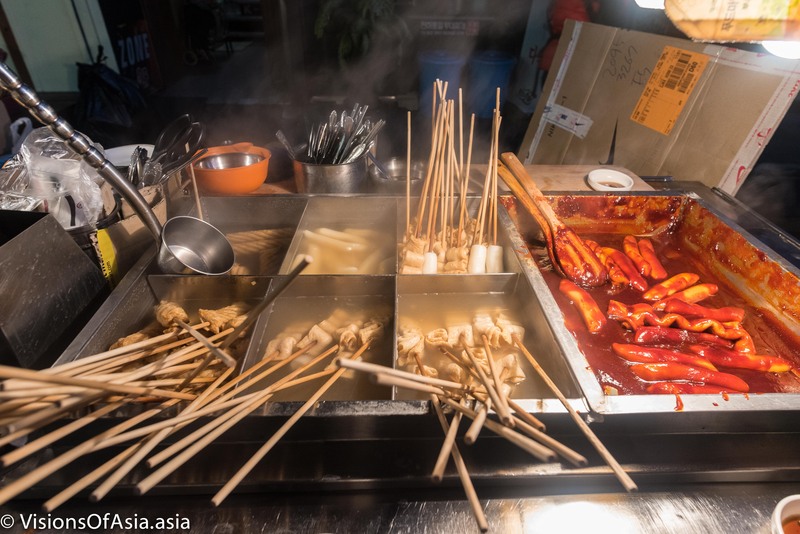 No worries, it is not gutters which are stinking, but the ever-present smell of the Taiwanese specialty, stinky tofu. 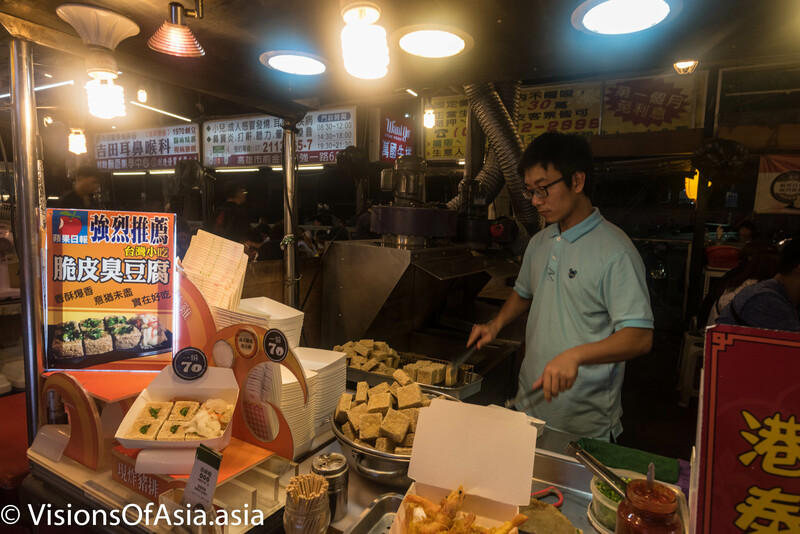 Those who tried it talk about stinky tofu a bit like durian: hard to stomach outside, but delicious once eaten. I was not that courageous so as to try the dish, but if you are interested, you might want to watch Andrew Zimmern trying it before going ahead with it. The program does a good job about explaining the experience very graphically! Still, the stench of this food pervades the whole market, but it is discrete enough not to spoil your experience of eating less “risky” food. 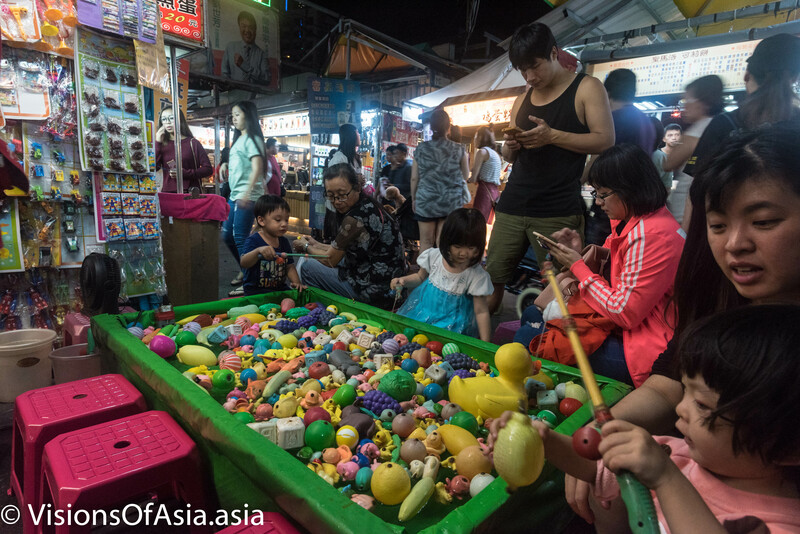 The interesting cultural aspect of Ruifeng Night Market is that the locals love to play some silly games to pass the time, just before or after meal. As such, the market is also a family outing. In photographic terms, it is an interesting place to get some atmosphere, provided you slip in close with a wide angle (pics were shot with a 20mm). 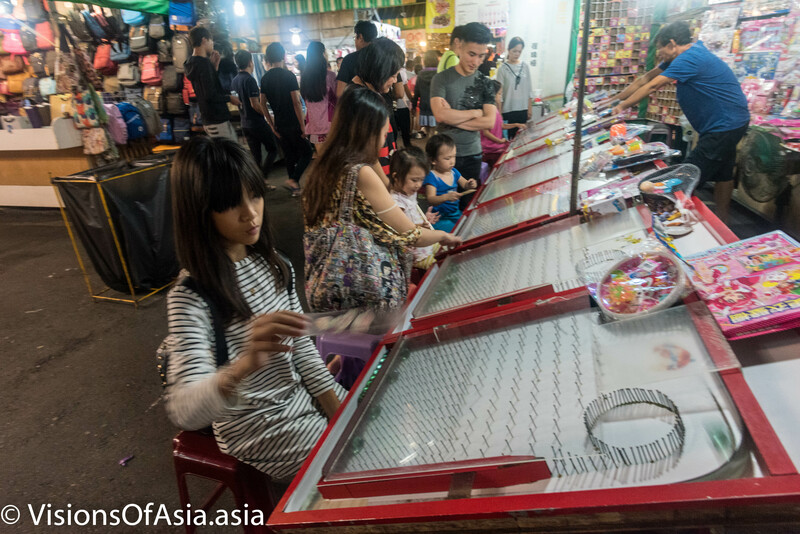 For adults and kids alike, playing some simple cheap games can also be fun. I toured all over the market, and in the end, not wanting to get my stomach too upset, I settled for a dish of udon. I must confess it tasted very good, but the seating was quite confined as you can see from this pic. The price was about 80 NT$, so still acceptable. 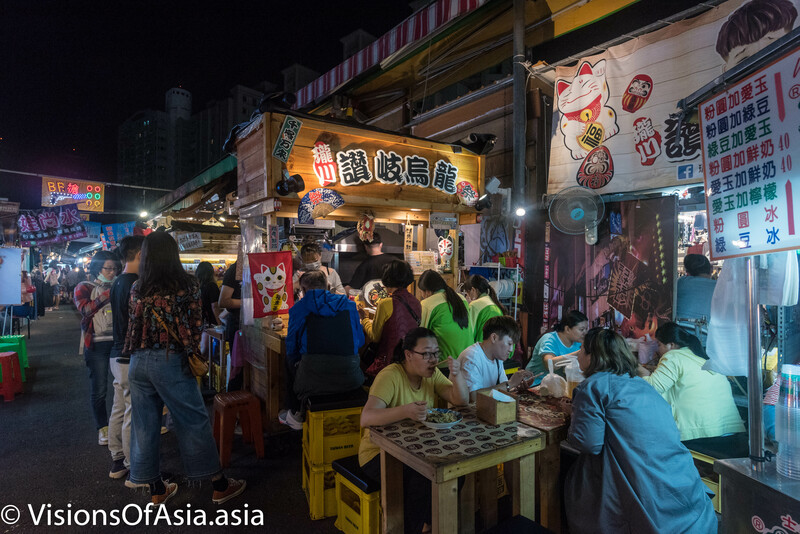 In the end, as can be seen from this visit to Ruifeng night market, this is a place to go to experience some of the real vibe of the Kaohsiung people. It is a place where mainly locals come (I didn’t see a single foreigner during my visit), but worth visiting if you are after authenticity and real taste. 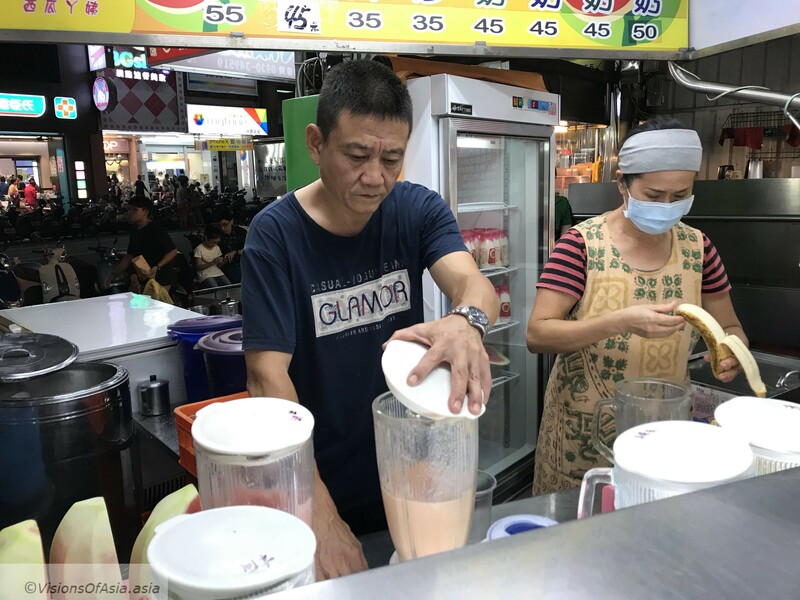 I concluded my meal with drinking a “papaya milk” smoothie, before heading back to my hotel. Getting there is quite easy. You must head to the Kaohsiung Arena MRT station. 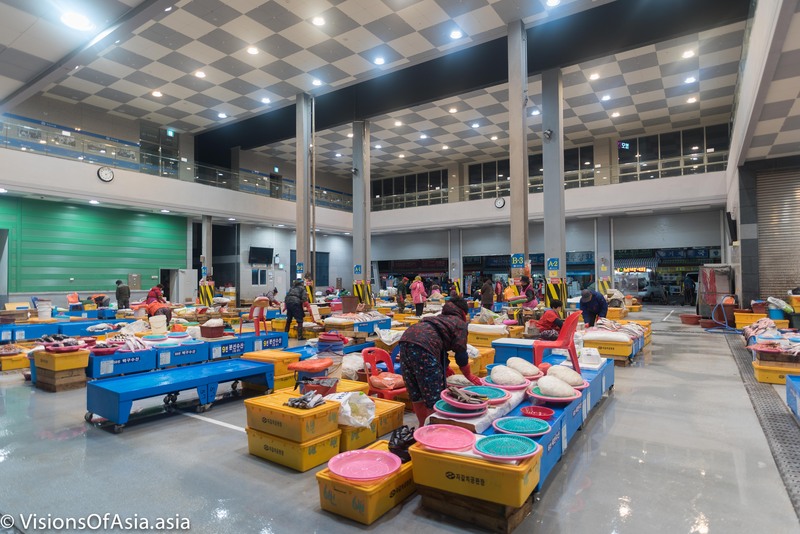 Take exit 1, and walk a couple hundred meters straight on Yucheng road, and you will find the market located just after a crossing. In the case you are still unsure, I added a map below, of course. Having lived for several years in Bangkok, I must say that I was gifted with a nice opportunity to take pics of pretty ladies almost at every turn, if we may speak this way. 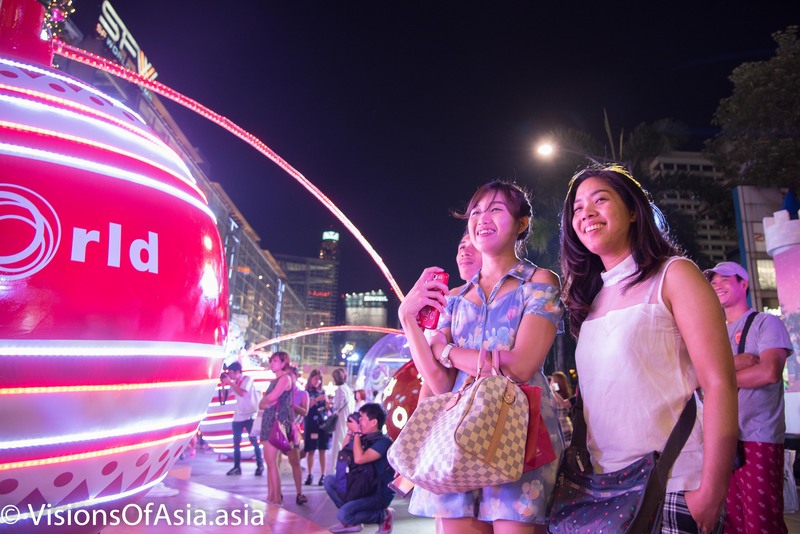 For street photography, Bangkok girls are a gift that keeps giving. A girl walks past Dusit Thani while checking her phone. 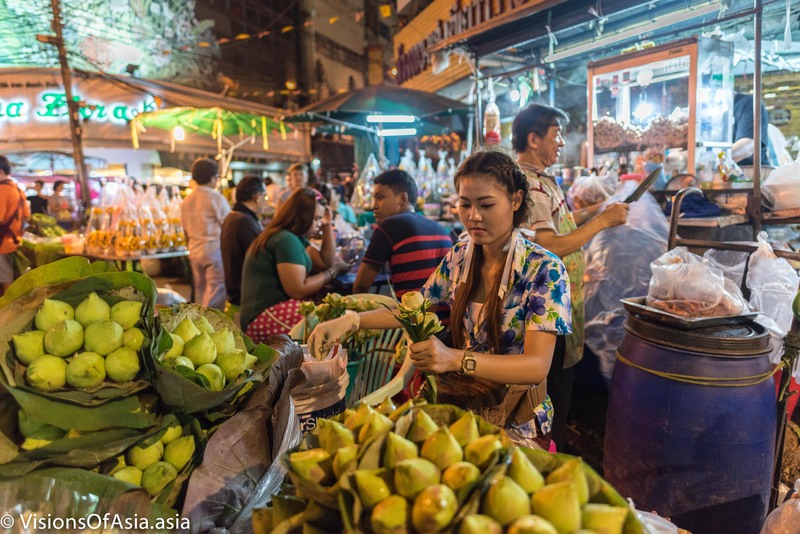 If you ever felt that you were limited by subjects, Bangkok is an incredible trove of subjects in terms of street photography. You do not need to go in red light areas to find interesting and pretty ladies – on the contrary. A girl waits near the MBK mall in Bangkok, while a bus rushes past. 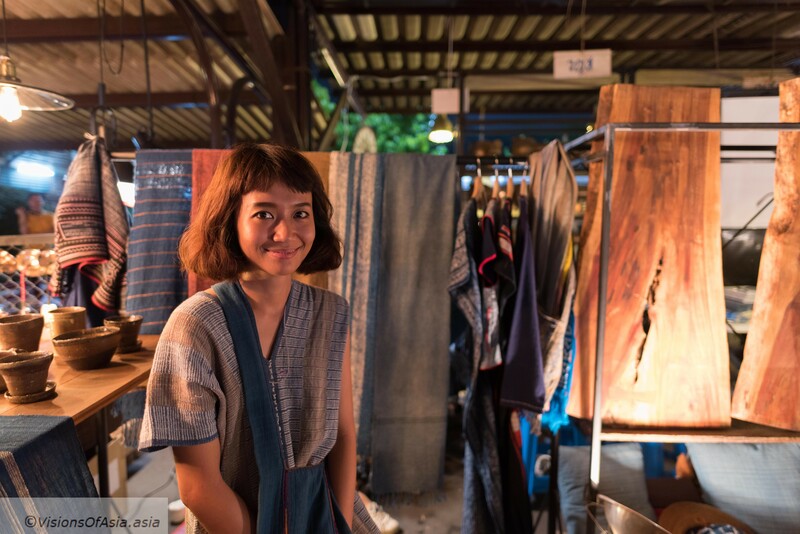 A vendor at a flea market in tones which reflect the linen which she was selling. If I did not ask this young lady for her permission I probably would not have had her look into the lens, nor her lovely smile which is just as warm as the surrounding clothes. 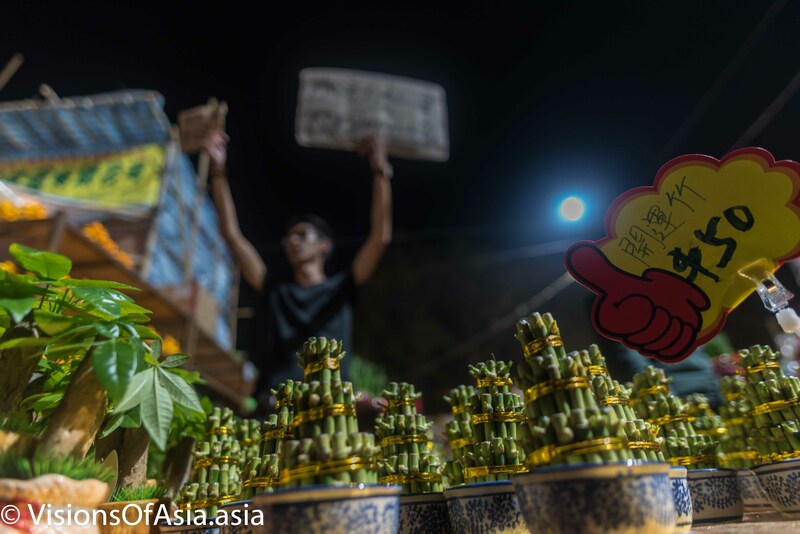 A beautiful vendor prepares lotus flowers for sale. In this case, it is a bit different, as I did not ask her consent, but I was very close (shot with a 20 mm), and she was happy to have her shot taken. Afterwards I thanked her for the picture. As the goal was to show her work, it was useless to have her pose. Of course, afterwards, I thanked her and she kindly acknowledged. Compare and contrast with this picture, where the lady poses for the picture. 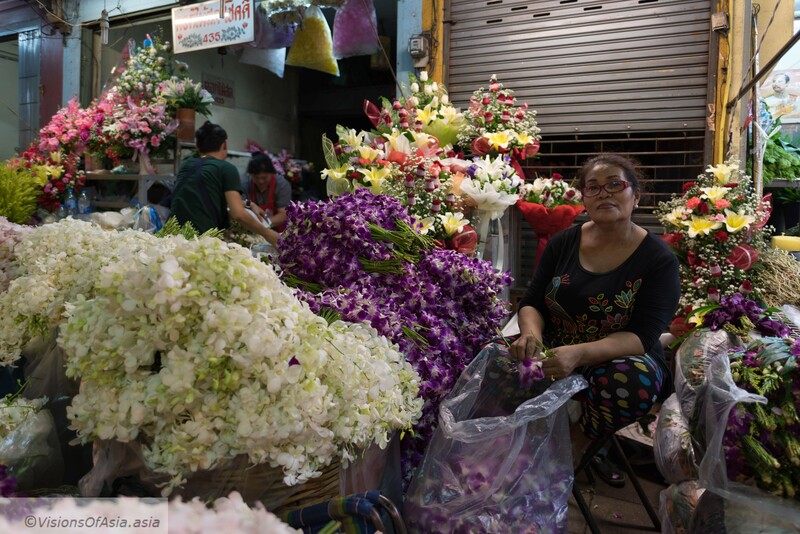 One of the vendors with the most colorful stands at Pak Khlong Talad. In short, there is no single answer. It will depend of the scene and what you are shooting. As much as possible, avoid being creepy though. Respect and appreciation of your subject is the key word in street photography. 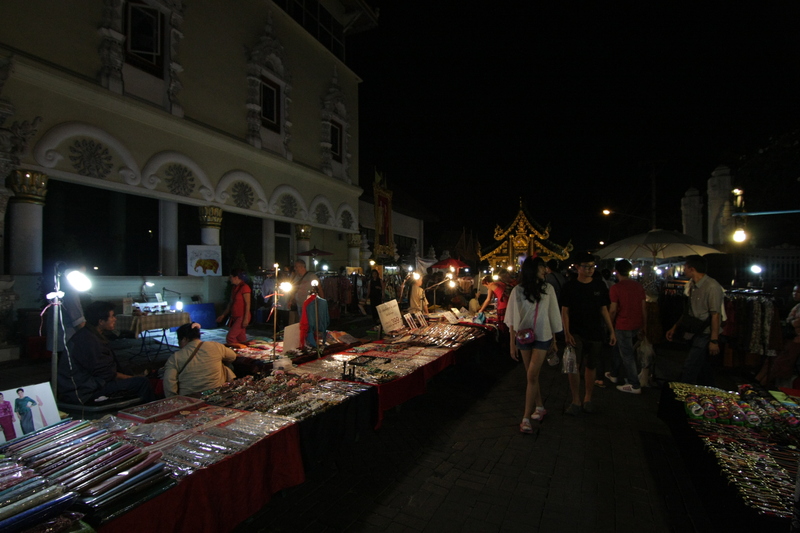 One of the main attractions for tourists in Chiang Mai is certainly its Sunday night market. 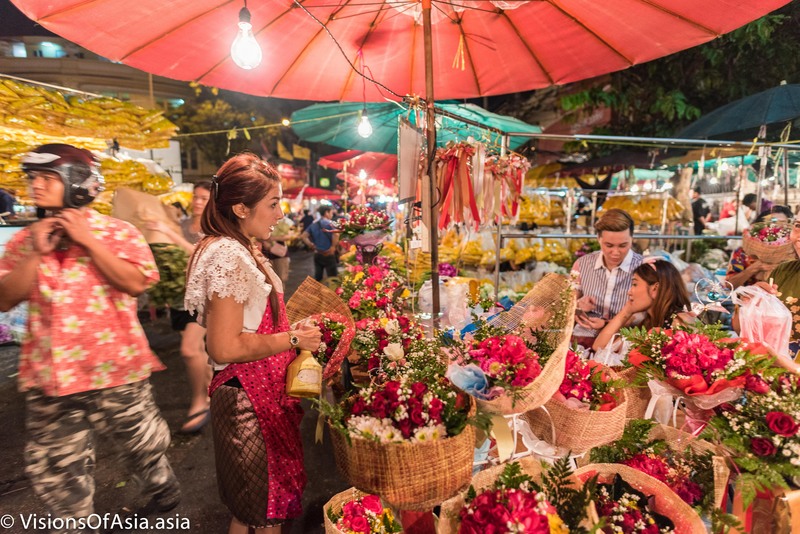 Sprawling across Rachadamnoen road, this market offers both, the occasion of seeing some real Thai craft, as well as a very lively and beautiful atmosphere. 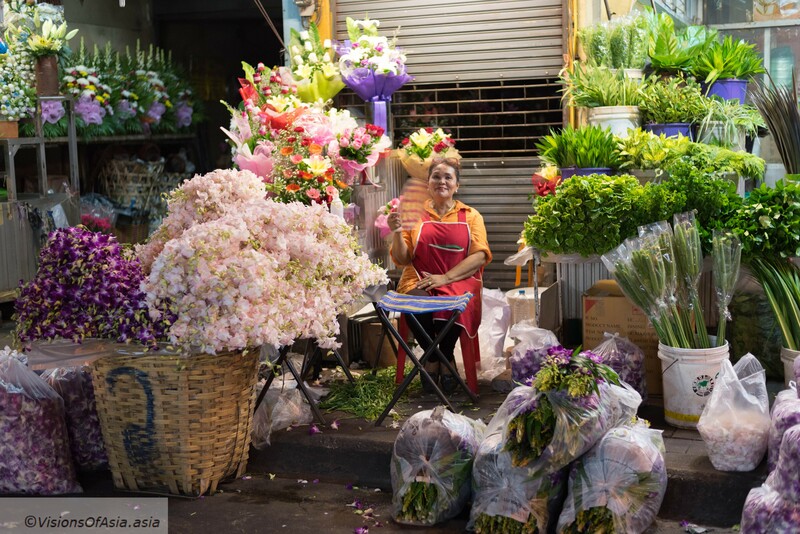 So, if you are in Chiang Mai, don’t miss visiting that market!